Sweatshops: A Dream Come True? In this article, Kristof begins by sensibly saying that before Barack Obama and his team act upon their endless discussions of “labor standards,” we should all of us take a more than cursory glance at a vast rubbish heap in Phnom Penh, Cambodia. “It’s a mountain of festering refuse, a half-hour hike across, emitting clouds of smoke from subterranean fires…. 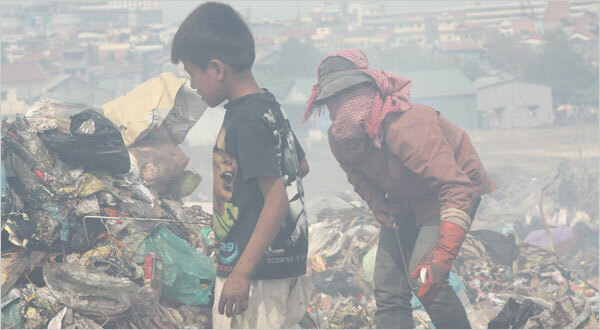 Then the smoke parts and you come across a child ambling barefoot, searching for old plastic cups that recyclers will buy for five cents a pound. Many families actually live in shacks on this smoking garbage. Vath Sam Oeun is another young lady Nicholas Kristof features. Vath Sam Oeun hopes her 10-year-old boy, “scavenging beside her,” will grow up to one day get a factory job. Her child has seen neither doctor nor dentist, not ever in his life, and the last time he bathed was when he was 2-years-old. The rest of the article is primarily a discussion of economics — one that specifically laments the poor working conditions of sweatshops, but one that also realizes what many of us have known for a long, long time: namely, that the poor working conditions in factories are not a cause but a symptom, and “banning sweatshops” will not help but HURT the poor of these Third-World countries. And yet, in spite of this, about sweatshops there is very little disagreement in this country: sweatshops exploit the poor. In fact, the thing most responsible for exploiting the poor is the authoritarian, often Marxist or neo-Marxist governments of the third-world, who keep their good people in a state of grinding poverty. And when will these governments, rather than American “corporations,” be held accountable by our progressive elites? When? And why is the third world plagued by poverty? Because third-world countries are all, virtually without exception, governed by regimes who “regulate” the economy. “Suppose Kathie Lee goes into a poor country, such as Peru or Bangladesh. The people there, say, are earning $3 per day, which is approximately their productivity level. Kathie Lee has three choices. She can offer these workers less than $3 per day, exactly $3 per day, or more than $3 per day. If she tries to recruit a labor force at, for example, $2 daily, the workers will spurn her. They may be poor, but they are not stupid. Even at $3 per day in total wages (including take-home pay plus the amount that goes into working conditions) this task will be difficult. Why should the employee leave his present position for an upstart, who will not at all improve his financial situation? “No, the only way Kathie can attract workers is by offering them better terms of employment than they now enjoy. If the students in the US who are so bitterly protesting poor Kathie’s economic initiatives really had the best interest of the poor workers in the third world at heart … instead of opposing her, they would carry her around on their shoulders in a ticker-tape parade, the way they treat winning athletes…. As in the case of the sweatshops, good old Kathie pays the kids more than they were earning from their domestic employers” (Protest! by Walter Block). The American anti-sweatshop campaigns (so-called) are ultimately motivated by a glut of economic misunderstanding and naiveté — a naiveté which comes mostly from those who do not realize that without factory work, these poor folks would be forced back into prostitution, selling their teeth, literal starvation, or scavenging through vast Cambodian garbage heaps. Naiveté, however, is hardly a legitimate excuse. Given academia’s long history of neo-Marxist socialistic propaganda and economic jargon, it should come as no surprise that the anti-capitalist rhetoric we hear on every college campus today pushes for “anti-sweatshop” legislation. In fact, though, what the student body and faculty ought instead to be calling for, rather than a world-wide dismantling of “sweatshops,” is a pat on the back of the American businesspeople who provide the third-world poor with gainful employment. Furthermore, there should unanimous support for foreign investment in the third world – if, that is, a genuine concern for the poor is really what American protesters care about. Which they don’t. “It is never the actual workers in countries like Honduras who protest the existence of a new factory there built by a Nike or a General Motors. [On the contrary] the people there benefit as consumers as well as workers, since there are more (and cheaper) consumer goods manufactured and sold in their country (as well as in other parts of the world). Capital investment of this sort is infinitely superior to the alternative – foreign aid – which always empowers the governmental recipients of the ‘aid,’ making things even worse for the private economies of ‘aid’ recipients. Market-based capital investment is always far superior to politicized capital allocation. Moreover, if the foreign investment fails, the economic burden falls on the investors and stockholders, not the poor of the third-world country” (How “Sweatshops” Help the Poor, Thomas Dilorenzo). “It is not only technology that the poor countries need, but the culture of capitalism. Without it they will never dig their way out of poverty” (“Common Sense in Sweatshop Cents,” by Vedran Vuk). “Wages are determined by worker productivity. Worker productivity is determined by the availability of capital goods(tools) to the worker to help him in his production. The availability of capital goods is determined by the prospect of profiting from such an investment. And the appropriate mix of investment in capital goods results from freedom in the marketplace. Thus anyone concerned with the welfare of workers should be the greatest advocate of free markets” (source). “Historically, real wages (wages adjusted for the effects of inflation) rose at about 2 percent per year before the advent of unions, and at a similar rate afterward” (Morgan Reynolds, Power and Privilege: Labor Unions in America,1984). If labor unions were responsible for the historical rise in wages, then the solution to world poverty would be self-evident: unionize all the poorest nations on earth. [And yet] private-sector unions reached their peak in terms of membership in the 1950s, when they accounted for about a third of the workforce. Today, they represent barely 10 percent of the private-sector workforce. All during this time ofdeclining union memberships, influence, and power, wages and living standards have risensubstantially. All of the ‘declining industries’ in America from the 1970s on tended to be the highly unionized ones, whereas the growing industries, especially in the high-technology fields, are almost exclusively nonunion. At best, unions can improve the standards of living of some of their members, but only at the expense of other, nonunion workers, consumers, and others. When unions use their power to go on strike, or threaten to strike, and succeed in increasing their members’ wages above what they could earn on the free market, they inevitably cause some union members to lose their jobs. What is the reason? When wages rise, it makes labor more costly, so that in order to keep turning a profit, employers can’t keep as many workers. So-called sweatshops may be bad by our standards, but to the Third-World poor, who face prostitution and rubbish heaps as the only way to eek out a living, sweatshops are a godsend.